Adorable seventies graphic design on the book depicted above. 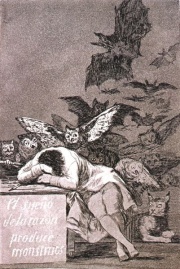 The Sleep of Reason Produces Monsters is a 1799 print by Goya from the Caprichos series. It is the image the sleeping artist surrounded by the winged ghoulies and beasties unleashed by unreason. 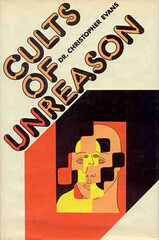 Unreason on the whole is a subject of innumerable greater interest than reason. As such, I’ll take the counter-enlightenment over the enlightenment any day. Conceded, there were interesting aspects of the enlightenment, ignored by history, such as the enlightenment of Thérèse Philosophe. See Robert Darnton’s The Forbidden Best-Sellers of Pre-Revolutionary France. This entry was posted in absurd, hauntology, horror, irrationalism, psychology, sensibility, subculture, subversion, surrealism, theory, transgression, uncanny, visual culture on March 4, 2008 by jahsonic.